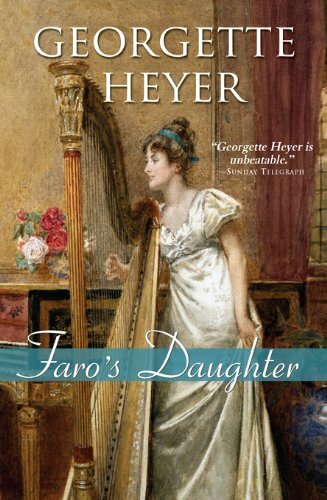 After slogging through last week's highly irritating historical romance, I picked up Georgette Heyer's Faro's Daughter as a literary palate cleanser. It might be one of her weaker efforts, but even C-grade Georgette Heyer still stands head and shoulders above most historical romances. Set in the late 18th century, Faro's Daughter is the story of lovely but poor Deborah Grantham, who presides over her aunt's barely-respectable gambling club. Deb has been gently discouraging the attentions of Adrian Mablethorpe, a wealthy boy barely out of the schoolroom who is utterly infatuated with her. But when Adrian's worldly, cynical cousin Max steps in, determined to save his young relative from the toils of a seductress, Deb decides to teach him a lesson—if Max thinks she is the kind of vulgar schemer who would entrap an innocent, then that is exactly what she will pretend to be. Faro's Daughter features appealing minor characters, plenty of humor, and a compelling (if implausible) plot climax. But Heyer's best romances feature pairings who genuinely like one another, and Deb and Max simply don't spend enough time together to develop much of a relationship. Thoughtfully-developed rapport is swapped out for physical attraction and manufactured drama, and while that's a combination that works—and Lord knows it's a formula countless other novelists use—it lacks the unique realism that makes Heyer's best novels so amazing.